Alpinestars has always offered a nice variety of women’s motorcycle gear, and this winter they’re giving us another option that fits into the adventure and touring market niches. Introducing…. the Bogota! This outfit sits nicely between the Stella New Land GTX and Stella Andes Drystar outfits, in terms of functionality and price point. You’ll find a bit more flexibility across a wider variety of temperatures with the layering options and additional ventilation points. The main difference with the Alpinestars Stella Bogota Jacket are the six vents that give you direct ventilation when you remove the waterproof and thermal liners. If you need a jacket that will work better for you in hotter temperatures, the Bogota will be a better choice for multi-season riding. You’ll find two vents on the chest, one on each sleeve and two on the back to keep you cool once the temperature starts to climb. One nice feature that I appreciate is the ability to fold the collar down once it gets warm, which is perfect if you find high collars uncomfortable, like I do. I also like the handwarmer pockets in front, as well as the two vertical chest pockets (not vents) for easy access on the bike. (These are horizontal on the men's version -- too bad, so sad!). As far as the fit, I would say that the sleeves run a bit long with a full European fit, and more on the slender side. The overall cut is three-quarter length (over the hips). If you have a shorter, wider torso like me, then you may want to try a size up. The matching Alpinestars Stella Bogota Pants are nice, but lack the ability to remove the Drystar membrane to provide direct ventilation. 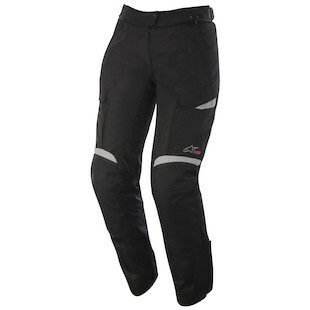 So these may not be the best option in hotter temperatures, but still have a couple of really nice features that make them a great touring pant. One main difference between the pants and jacket is the pants have a 1000D reinforced inner leg, in addition to the 600D outer construction. One feature I really appreciate is the convenient storage access while on the bike that the two cargo pockets provide. I’m not a huge fan of carrying things in my jacket, so any additional storage in the pants is a bonus. There are large zippered vents on each side, which again don’t offer direct ventilation, but may still come in handy for a little airflow. The fit on the Bogota pants is similar to the jacket, a nice European fit with a slightly lower rise compared to other brands. 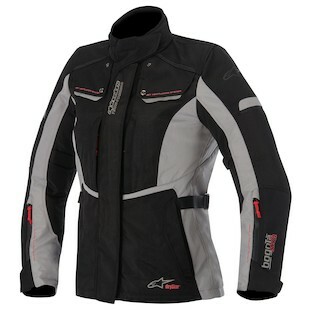 Removable suspenders provide a little more security, and the full circumference zipper attaches to many Alpinestars jackets. I’m generally a size small in other Alpinestars women’s outfits, and found the medium in this one to be a bit looser than I like. Although the medium fits me, I would prefer small for a more fitted, tailored fit. Overall, I think the Bogota is a better option than the Andes. For the slight increase in price, you get a few more features and a little more protection. These two are available in black only, sizes S-2XL. The Bogota Jacket is $349.95, and the Bogota Pants are $269.95.